250 Custom Square Stickers, prices starting at $96.50. We can print any custom shape you want including a square shape. Square stickers are a classic shape that can frame your logo, artwork, and more. It’s also easy to get your custom designs printed into square stickers that will get noticed by your fans and their friends! Square stickers are available in all of our custom sticker products. We offer full color printing on most of our custom square stickers. 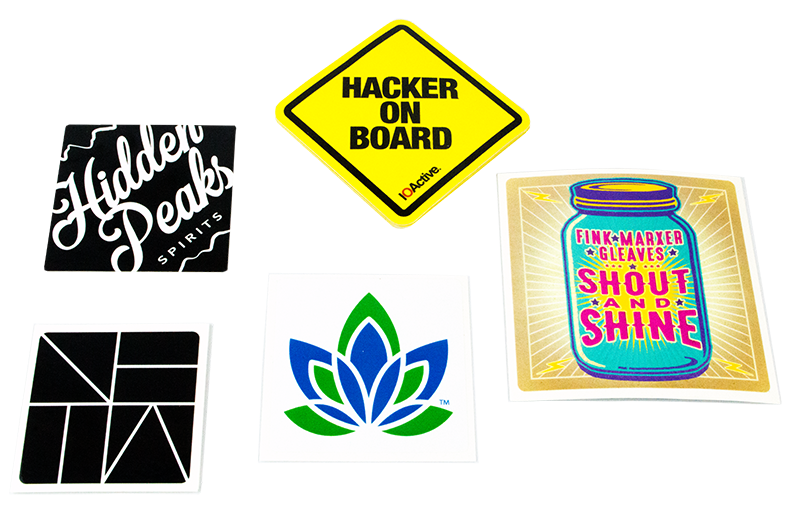 All of our custom stickers are available with Free Ground Shipping! Our digitally printed custom square stickers are cut with rounded corners. This means the corners will not curl up once you have applied your stickers, for a long lasting application. You can also find square corners with our Silkscreen Sticker product. Your stickers can be printed with a bleed in the color so your designs extend entirely to the edges, or you can design your stickers with a margin for a frame around your artwork. You can also get custom squares in any of our label options, which are ideal for indoor use, and product labeling.